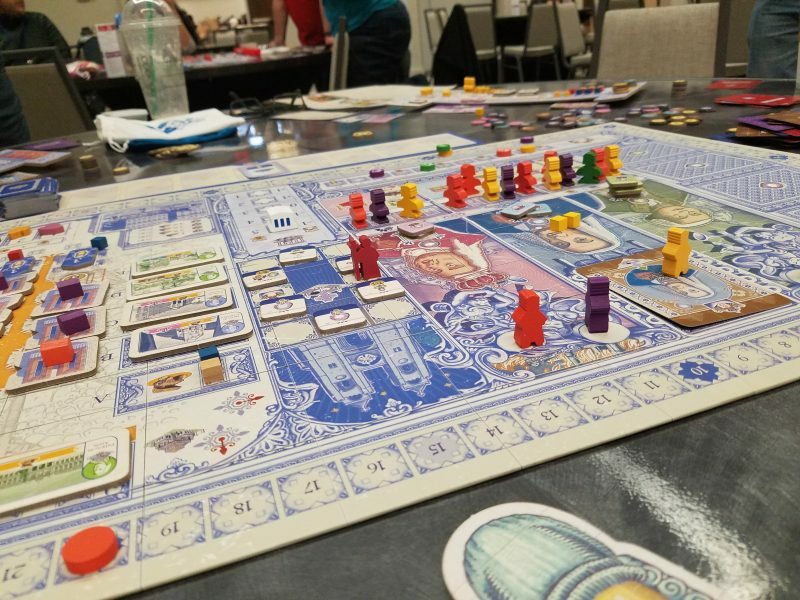 Lisboa, Portuguese eurogame master Vital Lacerda’s newest design, is a visual and mechanical smorgasboard–a hodgepodge of player incentives, feedback loops, and iconography teetering on the brink of “too much!” Until, of course, you play through your first game. Then, thinking back to the game as you restlessly try to sleep that night, it’ll start to make sense. Connections will form in your mind, and you’ll begin to realize that maybe this convoluted mess of a game might actually be…brilliant. I’ve been meaning to review a Lacerda game for a while. I’ve owned Vinhos for about a year but never felt like I grokked the game well enough to write about it. Then I was able to play a couple of games of The Gallerist but wanted to play it more so I could write a full review. Most recently I played a couple of games of Lisboa and realized that I simply needed to stop stalling and write. I don’t nearly have enough experience with it to call this a full review, but I can do a proper first impression with the knowledge that the learning curve for this game is something truly exciting. Lisboa is in its own way a testament to the amount of ingenuity present in board gaming today. Similar to 2012 sleeper hit Love Letter, on your turn in Lisboa you’re simply going to play a single card and then draw a new one. But these two games couldn’t be more different in scope and complexity. When you play a card in Lisboa you unlock a wide net of further decisions with their own cascading effects and implications. The first decision is how to play the card. You can tuck it under your player board for a small immediate effect and a long-term persistent effect. Of course, it’s not necessarily that simple. Some cards have a standard persistent effect that boosts your efficiency in some aspect of the game. Others will give you influence, an important resource, but only when you trigger a particular influence-scoring condition, which is dependent on taking other actions, of course. You can also play cards to the board in order to get the most action-bang for your buck. Go there and you can take a major and a minor action (I know they’re called something else in the context of the game but I honestly don’t care enough to look it up and remember) from one of the three noble dudes. There’s the king, the priest, and the…builder? Again, I don’t remember that much of the thematic flair. That’s probably a bit unfair. I’ve been told that every bit of the game design is thematically justified in designer notes in the rulebook, and that’s honestly something I’d gobble up except that I don’t own a copy of the game. What I do know is that Lisboa is about rebuilding the city of Lisboa after it was hit with a truly awful series of disasters. 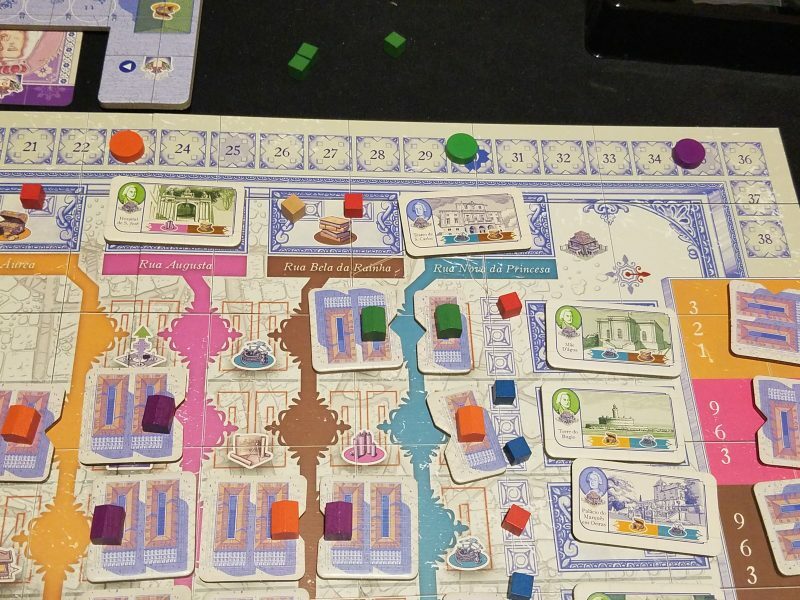 I also know that the game of Lisboa, even for someone who hasn’t read up on the designer notes, manages to capture the unusual blend of politics, cooperation, and competition that comes with rebuilding a city in the 18th century. Far from the stereotypical “multiplayer solitaire” euro experience, Lisboa is instead a game where every action sends ripples of consequences that affect every other player. Different actions can move an economic indicator, which changes how much it costs in money to build stores or how much it costs in influence to accomplish things. When stores are built, rubble is cleared away, making it cheaper for future stores to be built in that row or column. Goods can be sent on any player’s ship, though only the owner of the ship will get victory points for those goods. Public buildings will make stores in certain areas score victory points. Acquiring goods from your stores will decrease the value of those goods for everyone. And when you acquire certain tokens, you can follow up on someone else’s turn and take an action of your own. All of this manages to keep Lisboa interesting and engaging when it’s not your turn. It doesn’t suffer from the Five Tribes problem where it’s mostly useless to even consider your upcoming turn before it arrives because everyone else is changing the game state so significantly. Eurogames almost by definition are about trying to do the same thing as everybody else, only better and faster. Lisboa actually feels like you’re trying to do that, as the areas in which you are directly competing–physical space to build buildings–make thematic sense. Lowering the price of something through increasing supply also makes sense. Building in an area makes building further stores in that area cheaper? I get it. With the exception of the victory point cards, which provide points for various feats, every part of Lisboa intelligently constructed from a thematic perspective to a degree you just don’t see much. Back to those nobles. Primarily they’re going to help you construct stores, public buildings and gain victory point cards, and while those are important actions, you can be forgiven for not quite understanding the importance of any given action in your first couple of plays. Everything is so connected to everything else, and even the minor actions can be so critical to your plans, that it can be hard to see out of the game mechanism forest in which you’ve been dropped. Take, for example, scoring victory points for one of your stores. To do that you need to build a public building and a store (in either order) that are compatible with each other. In another game that might be a 2-3 step process. In Lisboa you need money to build a store, and if you don’t have enough you’ll probably need to sell goods. Of course, the main way to get goods are with stores, so you should be careful how you use your starting goods. Selling goods requires you to tuck a card instead of playing it to the board, so that’s an entire action. Building a building is another action. Building a public building requires spending part of an action to get a plan for a certain kind of building and then making sure that you’re able to use that plan to construct a building that applies to the specific type of store you built. 2 actions to acquire and construct it. After all that you’ll get a couple of VP’s. Of course, while you’re following that action path you’re dropping a rock in the metaphorical pond and causing ripples to spread out, possibly creating other, better action paths along the way to distract you. Additionally nearly everything you do has some kind of immediate effect. When you tuck a card you get a bonus. When you place a store or building you get a similar kind of bonus. Even when you buy a ship you score some influence just for getting the ship. Again, the action may be playing a card but the resolution of that action flowers out beautifully into something significantly more complex. Because you’re always doing multiple things at the same time, half of Lisboa is about maximizing the efficiency of your actions on top of planning out which actions you need to take in the first place. In my first game I had the idea that I was going to try to control public buildings, but I got so distracted trying to squeeze every bit of impact out of all of my actions that I ended up being one of the last people to construct one. The possibilities are (thankfully) restrained by the 5 cards in your hand, but the puzzle of what exactly to do on your turn is captivating. Lisboa also features what seems to be a staple of Lacerda designs: compelling players to fight for victory points while they’re building their engine rather than letting them build up to a grand finale. I was uncertain about this particular quirk at first but I’ve grown to love it. Having two of the three major actions in the game directly score you victory points makes the game feel compressed–you’re pressured to do what feels like the beginning, middle, and late game all at once, the entire game. It’s another way in which Lisboa takes the trappings of lesser Euros and makes everything that much more complex and interesting. 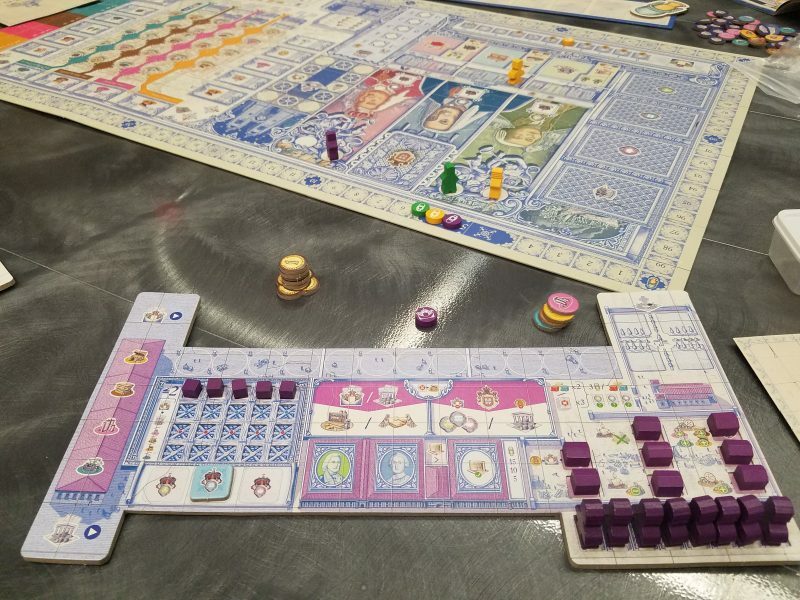 If you don’t like complex eurogames Lisboa isn’t going to convert you. The art design of the board is beautiful, but it’s an avalanche of icons tucked into every corner. Every bit of the game is described with icons somewhere. There were things on that board I didn’t even notice until my second time through. Each player gets an 8 page menu of sorts that tells them how the actions work and how to interpret every single of the games dozens and dozens of icons. While it ends up being super helpful, I can imagine eyes glazing over as people try to get a handle on what is actually going on. Even experienced players might find it too fiddly and inelegant in its rules. The primary action engine is very well designed, but there are enough small rules and bits of minutia to remember to be annoying. People who struggle with AP might also want to stay away. There’s a big gap here between playing the game, playing competently, and playing well that could grind some to a complete halt. Getting good at Lisboa will take work. And while I think that will be absolutely worth it, I also recognize that a sizeable number of people will find it daunting. Another small annoyance: the Eagle-Gryphon kickstarter version I played with had an issue with player boards warping rather significantly. It didn’t hinder play, but it was a nuisance and a disappointment given the attention to detail and quality of the rest of the game. Lisboa is a challenge I want to dive into. My first play made me confused but hopeful. My second play cemented, in my mind, the game’s conceptual brilliance. I laid in bed that night, thinking over my strategy, trying to piece together what chain of actions and reactions would have squeezed out more points. Each variation was another possibility, another strand on a giant web, inscrutable but mesmerizing.